As the fastest growing food storage brand in the world, Sistema is constantly innovating to keep up with expanding global demand, while maximising efficiencies to minimise manufacturing costs in its New Zealand factory. Sistema's innovative designs are a major part of their appeal, and they continually introduce new products into the market. Recently, this included a range of round soup mugs and other products with rounded sides. Sistema Engineering Manager Oliver Jensen says these proved to be a major challenge for their existing labelling machine, used on their traditional flat-sided products. "The rounded products just didn't label very well because they were virtually impossible to guide as they came down the conveyor. As they were presented to the labeller, you didn't know which orientation it was going to be, and the label placement was very inaccurate." "In particular, the tapered shape of the soup mug, and the fact that the product was still warm from the plastic injection moulder, also created some additional challenges. Conventional machinery could squeeze and warp the shape of the product, while also leaving marks." Initially, operators utilised a mandrel to manually label each rounded product. However, ever-increasing production demands meant that a more efficient, automated solution had to be quickly devised. "When we decided to look at a camera-guided robotic solution, there were many companies who were keen to sell us a camera, but most were completely unable to help us integrate it. That's where ControlVision came in - they were able to supply both the hardware and engineering know-how to make the solution work." 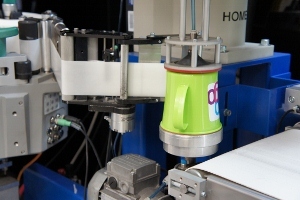 For the soup mug product, a Cognex In-Sight 5100 smart camera identifies the mug handle's location before the Adept Cobra i600 robot places the product on the labeller, in order to ensure an exact and consistent label placement every time. "We conducted tests where we ran the same product through the system multiple times, and each additional label overlapped the previous one perfectly, to the extent that only one label was visible." In other lines, products are also passed in front of a Cognex Checker smart sensor to ensure all the labels are correctly oriented. ControlVision made use of the VisionServer framework to coordinate communications between the robot and the camera, and to provide a simple user interface for setup. In addition to accuracy, the system is also faster than the previous, manual process, labelling at a rate of one product every five seconds, leading to a significant boost in production rate and a decrease in labour costs. Jensen says another major advantage of the system is its versatility at labelling the wide range of products Sistema produces. "The robots are very easy to set up, so instead of having to wind labellers up and down and having to set it up by trial and error, you can just push a button, change the robot gripper if required and you're away. It works very well with containers of all shapes." The smaller footprint of the new system also means more systems can fit within the limited space of the factory floor, another advantage when it comes to maximising output. 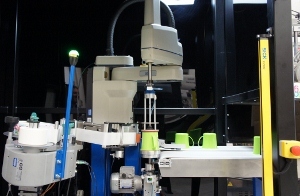 Since the initial labelling machine was installed, a total of six camera-guided labelling systems are now in operation, with four more due to be installed in the expanding production line. "It was a product which was impossible to label, and yet we labelled it with this solution, so we are very happy with the result," says Jensen.